The Philadelphia Flyers got some good news as it looks like rookie goaltender Carter Hart is healthy once again and could find himself in net as early as Monday against the Ottawa Senators, according to Philly.com’s Sam Carchidi. Hart has been out since Feb. 21 with an ankle injury, but he was also coming off two of his worst performances, having been pulled in back-to-back games in which he allowed three goals on just six shots in both appearances. If the team opts to start him against Ottawa, it would be an opportunity to ease him back into the lineup as the Senators are 1-8-1 in their last 10 games. The 20-year-old Hart is having a impressive season considering he was not meant to spend it in the NHL. Originally slated to spend his first professional season in the AHL, he appeared in just 18 games before being promoted alongside interim head coach Scott Gordon when he was hired. Since then, Hart was helped the Flyers rebound from a tough start with a 13-8-1 record with a 2.79 GAA. While that number doesn’t stand out, his .917 save percentage does. Paul Skrbina of The Tennessean writes that Nashville Predators forward Filip Forsberg missed Saturday’s game and remains day-to-day with an upper-body injury, according to the team. Forsberg missed practice Thursday and Friday, but was believed to be available for Saturday’s game, but didn’t play in the end. Forsberg missed 19 games with an upper-body injury earlier this season, although there is no word on whether this injury is related to that one. The 24-year-old has 22 goals and 41 points in 52 games this season. Michael Smith of NHL.com reports that Carolina Hurricanes forward Micheal Ferland remains day-to-day with an upper-body injury and did not travel with the team on their three-game roadtrip that started in Nashville today, according to head coach Rod Brind’Amour. Ferland has been having a solid season, putting up 17 goals and 35 points in 52 games. The 26-year-old has played under 14 minutes combined over the last two games. The Boston Bruins’ Jake Debrusk is expected to miss a few more games as the forward is still in a walking boot, according to The Athletic’s Fluto Shinzawa. While he’s expected to miss this weekend’s games, he could be back not long after that as head coach Bruce Cassidy said that Debrusk was the closest, of all their injured players, to return. Fox Sports’ Jon Rosen reports that the Los Angeles Kings are interested in undrafted Michigan State forward Taro Hirose, currently the NCAA leading scorer. According to Rosen, Hirose is friends with Kings’ prospect James Anderson-Dolan and could be convinced to sign with L.A. although there is no word on whether the junior forward is ready to leave college. He has 16 goals and 37 points this season for Michigan State. Friday: Dreger reiterated today that the Flyers and Oilers continue to talk of a Talbot trade. He claims the two sides are in a “holding pattern” and are trying to work out the kinks. The biggest new piece of news is that Stolarz, Philly’s impending RFA goaltender, is expected to be a piece of the return for Edmonton. Stolarz would presumably take over the backup job behind Koskinen this season, fitting under the salary cap without issue, and then challenge for the job again next year. Thursday: The Philadelphia Flyers have already used seven goalies this season, so why not make it eight? According to TSN’s Darren Dreger, the Flyers and Edmonton Oilers are “definitely talking” about a Cam Talbot trade. The 31-year-old keeper is an impending free agent and known to be at the top of the Oilers’ deadline sale list, while the Flyers are not exactly looking for short-term help, but a long-term tandem option. Were these talks purely for the purpose of Philadelphia using Talbot as a rental, they wouldn’t make much sense. The Flyers are eight points back of the rival Pittsburgh Penguins for the final wild card slot in the Eastern Conference and would have to leapfrog the Carolina Hurricanes and Buffalo Sabres to get there. The team is also already carrying three goaltenders – Carter Hart, Anthony Stolarz, and Mike McKenna – and has season-opening starter Brian Elliott on a conditioning stint. As it is, the team is probably going to have to place McKenna on waivers when Elliott is ready to return. They also have Alex Lyon in the minors and could get Michal Neuvirth back from injury by the end of the year. The Flyers don’t need a goalie right now; what they do need is a goalie for the future. The rookie Hart has been phenomenal at just 20 years old and is a core piece in Philly moving forward, but he needs a reliable veteran presence for the next few years as well. Elliott and Neuvirth (and McKenna) are all unrestricted free agents and Stolarz is an RFA with an injury history. The Flyers were destined to bring in a new goalie for next season and beyond and have apparently tabbed Talbot as a top option. Dreger notes that Talbot and Hart already share a good relationship, making it an ideal pairing of a promising young goalie in need of a mentor and a capable veteran who can no longer support a full work load. 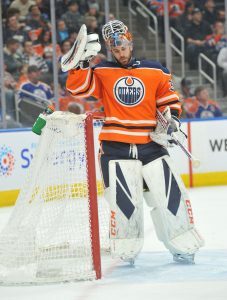 Talbot initially arrived in Edmonton after a breakout year as the backup for the New York Rangers, but truly broke out as a Vezina candidate in 2016-17 with a .919 save percentage and 2.37 GAA in 73 games. It would be the first of back-to-back seasons in which Talbot would lead the NHL in games played and this season he has felt the effects of being overworked. Talbot has an .893 save percentage and 3.36 GAA on the year, much of the reason why he lost out on an extension to backup Mikko Koskinen. 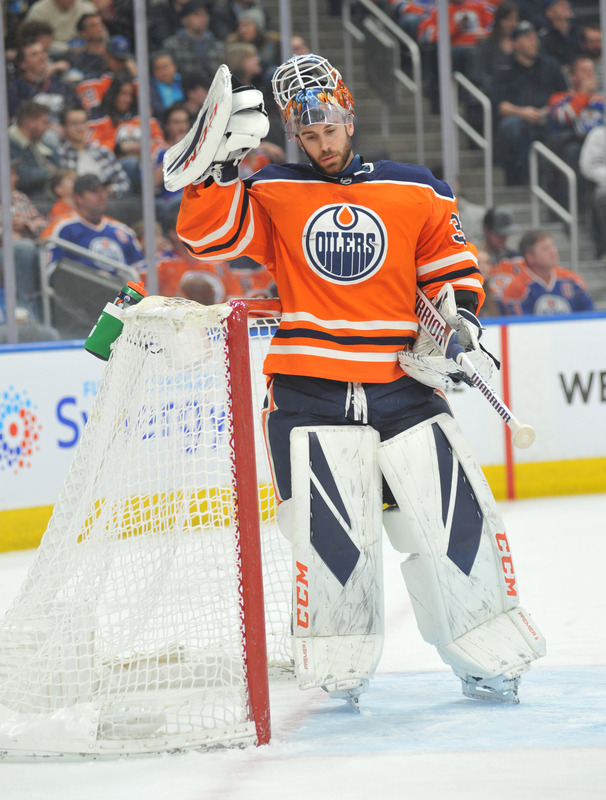 Talbot needs a new home moving forward, and preferably one with a share in net, but there are questions about how much interest he will garner on the free agent market. Philadelphia appears to be the ideal landing spot, especially if he gets to play there before the end of the season. The Flyers would also benefit from an early opportunity to sign Talbot, rather than just waiting for free agency. As for the Oilers, there is no hiding the fact that Edmonton is struggling to manage the cap and their roster right now. The team needs to make room for defenseman Andrej Sekera, but need to clear cap space and a roster spot to do so and have only through this weekend to figure it out. Trading Talbot, who the team has already determined is not a long-term fit, would be the easiest way to accommodate Sekera, which explains why trade talks are heating up. What the return will be for the veteran netminder remains to be seen. Since the Flyers could just wait until the off-season to sign Talbot, it likely won’t be impressive. However, with the Oilers maintaining that they are a buyer at the deadline, it will be interesting to see if Elliot or another Flyers goalie ends up as part of a hypothetical package. Edmonton’s odds at the postseason are slim, but asking Koskinen to start nearly every game down the stretch backed up by Al Montoya or unproven Shane Starrett certainly won’t help. The Philadelphia Flyers have become the most interesting team to watch over the last few days. Not because of anything spectacular captain Claude Giroux did at the All-Star game, but because of comments coming out of their front office. Just yesterday, Flyers chairman Dave Scott explained that the team will be aggressive in free agency this summer and today GM Chuck Fletcher spoke about their plans in the second half of this season. Most notably, Fletcher explained that he is “trying to make the team better at all costs” and is looking to “add better players and add depth.” Sam Carchidi of The Philadelphia Inquirer put it more simple terms, tweeting that Fletcher made it seem like “everyone is available in a trade except Claude Giroux” before adding that Carter Hart is probably on that hands-off list. If there is one name to focus on in Philadelphia of course, it’s Wayne Simmonds. The veteran power forward has been on everyone’s mind the last few weeks as the trade deadline approaches, and once again was a key point in Pierre LeBrun’s latest for The Athletic (subscription required). LeBrun makes the case for Simmonds playing for the Tampa Bay Lightning down the stretch, but also notes that Western Conference contenders like the Nashville Predators and Winnipeg Jets will surely check in before the deadline. It is important to remember though that Fletcher was brought in to make changes to this group, after former GM Ron Hextall was criticized for being too patient. The team has a huge number of top prospects still developing, but hasn’t been able to find the goaltending or defense to really compete in the Metropolitan Division even while they pay Giroux and Jakub Voracek like some of the best forwards in the league. James van Riemsdyk was inked to a huge deal in the offseason but has dealt with injury and inconsistency upon his return to Philadelphia, and the crease has been a carousel of names from the start of the year. Now that Hart is in place and looks like the goaltender of the present, not just the future, you can bet the Flyers aren’t interested in any sort of rebuild. The team wants to compete right away, and that makes them one of the toughest teams to read heading into the trade season. While they might move out some expiring pieces, don’t think they won’t add as well even with their eyes on next season. Players with a few years under contract could be of interest, especially given the team has only a handful of forwards under contract for next season. With 14 games left before the deadline and nine of those at home, Fletcher might wait just a little while longer to make sure that there’s no chance of sneaking into the postseason this year. But even if that stretch doesn’t go well, don’t think it’s just going to be a tear down in Philadelphia.